When the Mystery Kids visit a small village in the Scottish countryside, they make a startling discovery while exploring the nearby woods. Follow the children as they are chased through a maze of tunnels, rescue a trapped dog, taken prisoner by a gang of men, survive a harrowing plane crash, ride an out of control mine cart, and more! While setting up camp on Windswept Island, the Mystery Kids get the shock of their lives when three strange men appear and kidnap the girls. 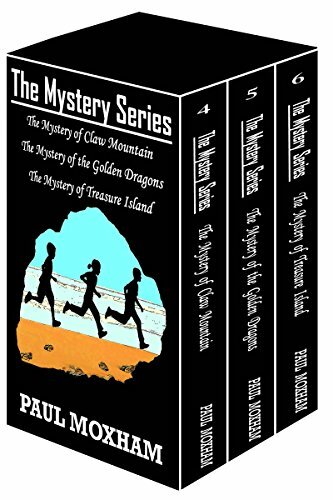 Follow the children as they are whisked away to an Eastern European country, held captive in Dragons Den, meet a British spy, get chased by dogs, swept down a raging river, and more! When a ferocious storm lashes the Caribbean, the small plane in which the Mystery Kids are flying is forced to land on a deserted island, but all is not as it seems. Follow the children as they flee an erupting volcano, are attacked by pirates, pursued by sharks, hunt for buried treasure, chase a thieving monkey, and more! These adventure stories will suit people who enjoy Nancy Drew, the Hardy Boys or the Famous Five.